Two things fascinate me about the institution of schooling: 1) How the environment around the school impacts the culture of the school and 2) The structure of the school management and how it makes decisions. I went out for an alumni dinner from my alma mater last week and had some fascinating conversations with people that had very different careers from my own. One, a fresh graduate, was a management consultant for Ernst & Young. He told some stories about the cultures of certain businesses and how it was his job to realign them to be more purposeful. “The oil industry is all compliance driven,” he said, “So it’s tough to build in any creativity or things out of the norm. It was my job to untangle their complex and clogged systems of compliance to allow more flexibility in a rapidly changing market to allow for adaptations before things went into the tank.” Schools hire strategic consultants to come up with all sorts of things like new technology programs, NGSS, literacy initiatives, accreditations, and so on. A few take symbolic gestures at governance structures but they are mostly compliance driven and address things like whether or not the procedures for updating the policy manual have been reviewed. Very few allow someone to come in and look under the hood to see what’s really driving the work flow. (or not). It made me reflect on what a critical thing such as cultural attitudes towards work can impact something so operational as escalator speed. When we work in a hyper competitive environment, we don’t pay attention to the big picture, whether we are ‘compliance driven’ as the management consultant described, or even the people trying to step onto a whizzing escalator. We pay attention to the output, the outcomes, and the pressures that force the escalator to move faster or the oil company to be more compliant. The young graduate told me that he simply crunched a lot of data and pointed things out for them to decide. He’d highlight the time for supply chains to reach their destinations, for invoices to be approved, for policy decisions to be made, all of the meat and potatoes of managing large companies. It was fascinating to think about the similarities to schools. 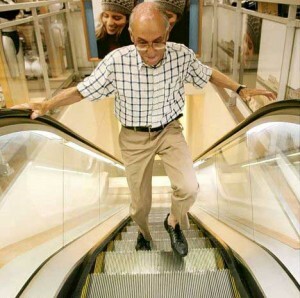 And the escalator speed? Fascinating parallels. I know a lot of people (including myself) that have gotten tossed from that high speed staircase. There are actually some really bold attempts to break down the compliance driven, top down, creativity, risk averse, and fear driven hierarchies that many educators work in now. One is The Mastery Transcript Consortium, (mastery.org) which is looking to redefine the way we think about and record high school academic work, and the other is the ACE Accreditation from NEASC, a bold initiative that is going to reshape the entire structure of oil company compliance that drives many schools. So, whether you’re working in a bureaucratic and inefficient environment such as one where the post office closes during lunch (a very maddening experience) or one that is so efficient it is tossing retired folks off the conveyer belt like potatoes, you have to acknowledge and accept that the culture that surrounds you will have a direct impact on the place you work and the expectations placed on you, regardless of how high your gates are or how bold you believe your mission to be. Think culture. Think mission. Think environment. And most of all, think relationships, they are the root of everything we do. This entry was posted in Stephen Dexter and tagged ace accreditation, culture map, international school community, learning design, management, organizational design, School Culture. Bookmark the permalink. Seems like students in Singapore and around the world are also on that escalator. The drive for maximum AP classes, high GPA’s, extra-curricular activities — all in the name of college admissions — is putting tremendous stress on students and taking the fun out of learning. The whole process has kids arriving on college campuses with anxiety, depression and other mental health issues. New approaches like the Mastery Transcript are heartening so students can get off the high-speed escalators and learn the old fashion way — through apprenticeships, hard work and real-life experiences. They’ll find taking the stairs is healthier all the way around!